Every Iron Man Movie card box includes 2 Autograph, Sketch, and/or Costume cards. 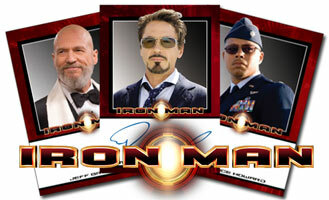 Autograph cards include Robert Downey Jr., Terrence Howard, Jeff Bridges, Faran Tahir, Jon Favreau, and more! Costume cards include items worn by Robert Downey Jr., Gwyneth Paltrow (Pepper Potts), Jeff Bridges (Obadiah Stane), and Terrence Howard (Col. Rhodes). Sketch cards will include movie sketches as well as comic book sketches from actual Iron Man comic book artists (Brian Denham, Emir Ribeiro, Harvey Tolibao, Cat Staggs, and others). Bonus cards include Iron Man Archives cards (key moments from "Tales of Suspense"), Casting Call cards (featuring the cast of Iron Man), and Armored Hero (featuring Iron Man in action). A case topper card signed by Iron Man co-creator Larry Leiber is inserted one per case. 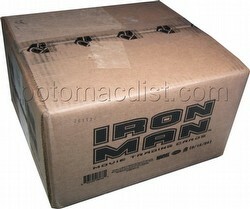 Customers pre-ordering 2 cases (24 boxes) receive an Iron Man armor prop card. 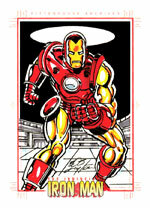 Customers pre-ordering 4 cases (48 boxes) receive a hand-drawn sketch card by Iron Man artist Bob Layton. Billionaire industrialist and genius inventor, Tony Stark, is kidnapped and forced to build a devastating weapon. Instead, using his intelligence and ingenuity, Tony builds a high-tech suit of armor and escapes captivity. When he uncovers a nefarious plot with global implications, he dons his powerful armor and vows to protect the world as Iron Man! On April 30th, Rittenhouse Archives will release its Iron Man Movie Trading Cards, the perfect companion to what will be one of the hottest and most high-tech movies of 2008! Each box of this set will feature 2 Super-Collectable Cards Per Box! 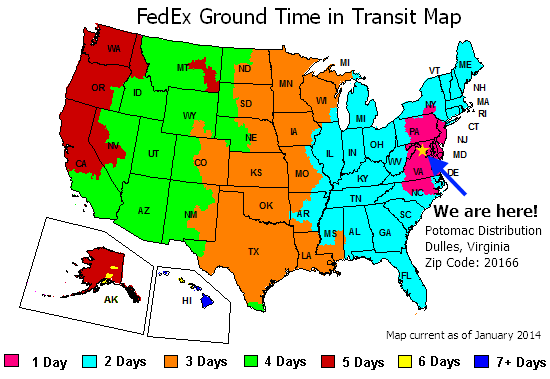 including Autograph cards, Sketch Cards and/or Costume Cards. More to be announced in the coming weeks! Costume cards will feature authentic screen worn costumes from the movie's main characters including Tony Stark, Jim Rhodes, Pepper Potts and Obadiah Stane! Also randomly inserted will be Iron Man sketch cards. There will be two different styles of sketch cards, one featuring the movie version of Iron Man and the other the comic book version. A complete list of sketch artists will be announced shortly. Each case will come with an exclusive autograph card signed by Larry Leiberman, script writer for "Tales of Suspense #39" and co-creator of Iron Man. For every two cases customers pre-order of Iron Man Movie Trading Cards they will receive an Armor Prop card featuring a piece of the Mark I, Mark III or Iron Monger armor. For every four cases customers pre-order, they will receive an Exclusive Sketch Card from legendary Iron Man artist Bob Layton! Iron Man, the Movie © 2008 MVL Film Finance LLC. Marvel, Iron Man, all character names and their distinctive likenesses:TM & © 2008 Marvel Entertainment, Inc. and its subsidiaries. All Rights Reserved.